This graph summarises how NIWA’s recent adjustments to the historical temperature data has created a 20th century warming trend of 1.0°C. There were 22 changes in the period 1900-75 and almost all of those adjustments went downwards. Over 90% of the adjusted station-years moved in the same direction – a very surprising result. Another curious aspect of the NIWA adjustments is that their amplitude is almost directly proportional to their chronological age. The further back one goes from 1975, the larger the adjustment becomes. 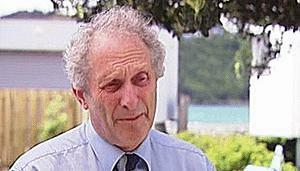 Dr Jim Salinger, former NIWA Climate Scientist and much-loved television weather commentator. This is partially explained by NIWA’s practice of adjusting all the historical measurements to be consistent with the current open site. The years prior to a “discontinuity event” are changed up or down to the temperatures they would theoretically have shown if the current site was then operational. The adjustment continues on backwards until the next discontinuity is encountered – the exercise is then repeated, and the adjustments aggregated. In a normal case, where adjustments go both upward and downwards, they have a tendency to cancel out in both space and time. To the extent this doesn’t happen, the result appears as a “saw-tooth” curve. But, in the case of the “7 Station Series” (7SS), where all the adjustments go the same way, they simply aggregate over time. The further one goes back from 1975, the colder it gets! 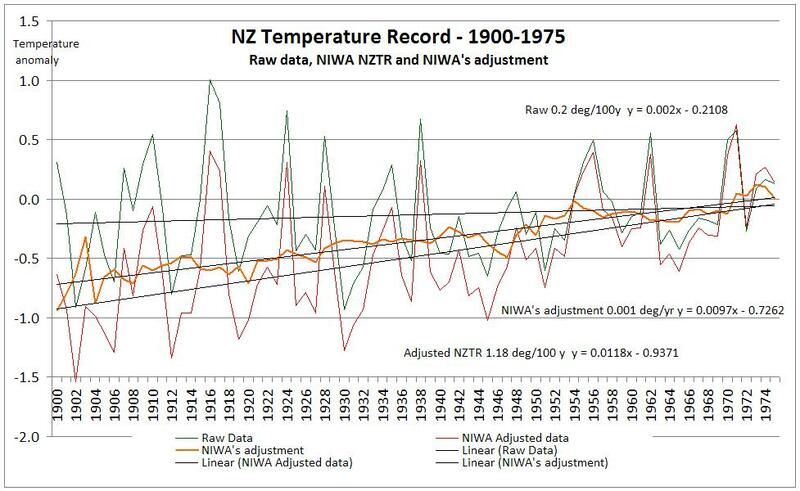 In the late 1970s a then amateur analyst looked closely at New Zealand’s historical temperature records. Knowing from Hessell and others that the data was riddled with errors and uncertainties, he made a detailed inventory of 78 weather stations – noting all the hundreds of recorded incidents which likely led to mistakes. But there was no known methodology to test for errors, and no known remedies to correct them. He decided to invent a novel process, which would produce a better outcome than the raw data. But where to start? What could provide a guide? Many subjective judgements would be required, and endless options were available. Jim was once a bright-eyed young student in England. Did he have a bright idea as revolutionary as it was simple? Have we discovered its secret? Young Jim Salinger was already convinced that average New Zealand temperatures had increased by a lot more than the raw data disclosed. 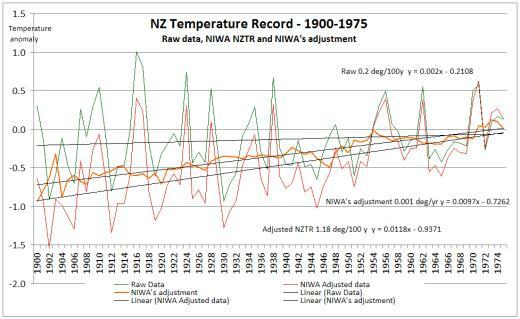 The high point of his nascent meteorological career was his brave 1975 article in “Nature” postulating that New Zealand glacial melt showed sustained warming. And this was in the very year when the world’s media were headlining the coming Ice Age! Global average temperatures had been decreasing for over 30 years. Jim knew from his glacier work that the warming trend should be fairly steady, rather than featuring a handful of ‘king hit’ years. Where did he go next? Did he conjure up a nice round trend like 1.0°C/century and plot a steady progression into a template graph? Or did he use some other hypothesis to guide his work, or to work as a ‘sanity check’? We’ll never know. All of his 1977-80 spreadsheets, trial runs and calculations were undertaken on the old Burroughs mainframe at Victoria University, and unfortunately passed into history in about 1983. No copies were kept and the work has never been published or even replicated. All we can do is look at the outcomes, and see what they suggest to an enquiring mind. A simple model that describes NIWA’s adjustments. Click for larger version. 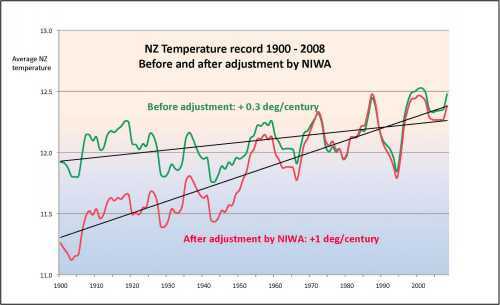 The red line shows the official (unsmoothed) NZTR, while the green line shows the raw data in the historical temperature record. The amber line depicts the adjustments between the two – as adopted by NIWA from the thesis. Now, when we measured the linear trend of the Salinger adjustments, we discovered it was exactly 0.001°C per annum, or 1.0°C/century. Could that nice round figure be a simple coincidence? You be the judge. Jim Salinger’s student days at the University of East Anglia must have had an influence upon his thinking and methadology – any academic in the field of Climatology in the UK who claims the same Alma Mater as Salinger gets funny looks from the public since the Climategate emails surfaced! And a bit of gobull warmiing here in the UK right now would be very welcome – it’s b****y cold here right now. So when Kupe arrived in 925AD it was -10.75C below the 1975 norm. I would have gone straight back to Hawaii. Climate sensitivity to a doubling of CO2 (390 to 780 ppm) 1.64 degrees , nothing to see move along!! No, no, you have it entirely wrong. The Maori walked to NZ across the ice, they only built sea going vessels after it melted. I’m more inclined to the more plausible notion that they traveled by ice waka. These were the early forerunners of ice yachts. I suspect that the Australian Aborigine were in fact Hawaiians blown off course in their ice waka on the way to Aotearoa (The land of the long white cloud). The Maori translation of Ice waka seems to be “tio waka” or “waka tio”. Although don’t quote me on this because I don’t know what I’m talking about,.not being a Maori linguist.